Although most of us think of jiggly, colorful bowls of sugary Jello when we think of gelatin, after reading this article, you’ll have an entirely new outlook on gelatin and why you may want to supplement with it for healthier, more vibrant skin. 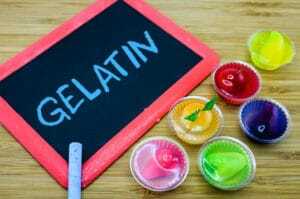 Gelatin is type of protein that is derived from collagen. This collagen comes from animal parts that are no longer commonly consumed in the American diet. You see, we live in different times. Historically, mankind did not have the luxury of being overly choosy about which parts of the animal would be eaten. This meant that bones were used for creating broths, soups, and stews, while other parts of the animal from organs, to skin, to cuts of meat containing large amounts of cartilage and sinew would be cooked in any number of ways – and consumed. It just so happens, that in our taste for “good” cuts of meat, we’re throwing away some of the healthiest parts of the meat we eat: the collagen rich parts. Unfortunately, this tossing aside of the collagen-rich portions of food means we get far less collagen naturally in our diets and this affects everything from our joint health, to our digestive health, to our skin health (and more). You see, there are (at least) 16 types of collagen found in the human body. Yes, there are actually different types of collagen! It isn’t all just the stuff that makes your skin look plump and youthful (although I know we beauty enthusiasts are primarily concerned with that type of collagen). Collagen, in its various forms, is the predominant protein of the human body and is found in muscle, tendons, skin and even bones! As we age, collagen production decreases. This decrease begins around the age of 40 and becomes much more dramatic post-menopause. A decrease in collagen production results in compromised integrity of our skin’s structural systems and leads to all the common signs of aging: lines, wrinkles, hollowness beneath the eyes, reduced skin hydration, and laxity. In truth, there are far worse problems that may occur in the body when collagen is decreased (like poor joint health), but since this article is about gelatin and your skin, we’ll focus on the important relationship between your skin and your collagen intake. Our bodies construct themselves from the foods and drinks we consume. This is as true for your skin as any other organ. With the slowing down of collagen production mentioned earlier, one way we can continue to provide our bodies with the building blocks for healthy skin is through consuming foods rich in those nutrients which are integral to healthy, firm skin. Gelatin is a key player in this arena, as it is full of just the right amino acids for producing long term structural improvements in your skin and other body tissues. Have you ever cooked up a pot of soup or made a stew and noticed that overnight some strange jelly-like substance formed in the pot? That’s gelatin. That’s collagen. That weird gelatinous stuff makes for healthy skin (and joints, and bones). Adding gelatin to your diet (we’ll talk about how to do this next) can create substantial improvements in the health of your skin over time. To be clear, this is not a magic potion that will mysteriously make your skin look 20 years younger after a few days to a week (those don’t exist in reality). Instead, it is a longer term plan for providing your body with the raw materials it needs in order to produce healthy skin tissue over the course of your life. A decrease in collagen production results in compromised integrity of our skin’s structural systems and leads to all the common signs of aging: lines, wrinkles, hollowness beneath the eyes, reduced skin hydration, and laxity. When a person begins supplementing with gelatin, she may notice some changes rather quickly; others may think is happening at all. Because we see ourselves every day, we don’t always notice those small improvements the way someone who only sees us occasionally will. Conversely, if we have a significant problem that a certain nutrient really hits hard very quickly – we’ll be more apt to notice changes sooner than expected. Then, there is the fact that for people who begin caring for their skin early on – they may never witness marked “improvements” because there was never much to improve. Rather, the skin is healthier overall, ages less quickly, and retains more youthful qualities over a longer span of time. Adding gelatin to your diet can lessen the appearance of wrinkles, slow down the early onset of sagging skin, maintain and improve skin firmness, increases skin hydration levels, and aid in maintaining and restoring vibrancy and vitality to your complexion. Problems in any of these areas are often related to both damaged collagen fibers and a slowing down of collagen production. Daily gelatin consumption can improve these conditions – along with creating benefits for your hair, nails, joints, and bones. The tricky thing about supplementing with gelatin is that gelatin – gels. Certain more processed forms of gelatin are both hot and cold water soluble, but the standard form of gelatin is only soluble in hot water. 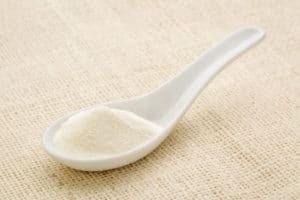 For this reason, many people will mix a few teaspoons to 1 tablespoon in a hot cup of coffee or tea. Interestingly, it really has no taste, so although I was skeptical about mixing gelatin into coffee, I can tell you – it’s completely tolerable! Another way of getting gelatin into your daily food plan is by mixing it into smoothies that will be well blended. Again, gelatin gels, so you have to watch how much you’re adding. A tablespoon of gelatin mixed with cold liquids will turn into a giant glob of unappealing goop. This is where the blender comes in. Blend a smoothie like crazy to distribute the gelatin. Gelatin can also be added to warm breakfast cereals like oatmeal, hot soups, stews, and broths, and can even be tossed in to other recipes you might make. I read about one lady who randomly adds gelatin to all sorts of recipes – from meatloaf to chili. Because it dissolves in hot liquids, it can be added to any number of dishes where it will never be noticed. The type of gelatin I use is a bulk Unflavored Gelatin . I am an Amazon Prime member, so I just have it shipped in as needed. This particular gelatin is used widely in both the culinary world and by people who supplement with gelatin. There is no flavor, it is basically colorless and odorless. I began supplementing with gelatin at about 1 tablespoon per day, but am now taking 2 tablespoons daily. I divide this amount between morning and evening – or frankly, whenever I find it convenient. While discussing gelatin as a form of collagen supplement, you’re likely to wonder if topical collagen products work. Here’s the problem: collagen is a big, fat, protein molecule. It doesn’t do so well, being so large, at penetrating the very tight network that is the surface of your skin. Remember, your skin’s surface is a network of keratin filled skin cells which are surrounded by a matrix of lipids (fats) and other goodies that are meant to keep bad stuff out and good stuff in. So, although some ingredients and nutrients do very well at penetrating this barrier, big molecules do not. Collagen on the skin’s surface works more like a (very) temporary patch. There is no long term improvement to the deeper layers of your skin when applying collagen topically. That said, it can make it feel nice and look better – so a collagen mask before an event is never a bad idea. Just remember, in the case of collagen, you really need to be getting it in your body, not just on it! If you decide to begin supplementing with collagen, I’d love to know! For those who already do, I’d love it if you’d share in the comments how you use it, what you mix it with, and how it’s improved your skin (or anything else).